To say I have experience of ME is an understatement. I've been on this roller-coaster for over twenty years, it's changed my life, dominated my childhood and shaped the woman I've become. I've learnt a lot and it's sent me in a direction I never expected. I became ill at 10 years old, housebound at fifteen, bed bound at sixteen. I was in hospital for six weeks and bed bound for six years. With time and careful pacing I am now slowly recovering. There's been ups and downs, I'm still living with the condition but life is so much better than it was. I've improved since I was bed bound. With lots of pacing, resting and careful management of my energy levels I can now do so much more. I'm still really careful but life is completely different to the way it was. Sadly there's no quick fix, no magic cure but I believe it is possible to improve. I am able to go out more and I love it, even when I have to use my wheelchair. I hated the chair when I first got it but now I couldn't imagine life without it. It's my freedom! Through out my experiences with illness I've always fought to have a life, to not get lost within my condition. I believe that just because you face challenges and obstacles, it doesn't mean you can't have a great life. I certainly am. Way back in 2004, I was filmed over the course of a year, for a BBC One documentary. It's strange to look back on that time, as so much has changed for me but I know that many are still living through that situation, so I share this in hope that it helps them and raises awareness of what it's like to live with severe ME. Time - the one thing I have lots of! 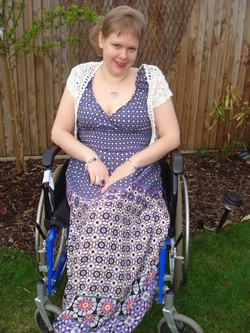 Coping with "Big" Birthdays when you're ill or disabled. Turning 18, 21, 30, 40, 50... Things to be proud of. The ME/CFS World - What's changed in 20 years? Time and Energy - living with limitations - how do you decide what to do?